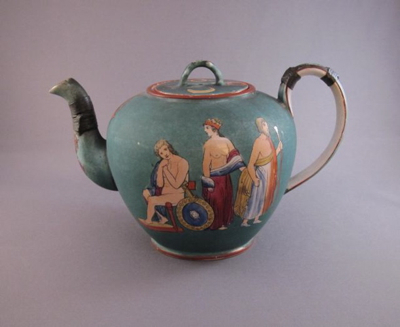 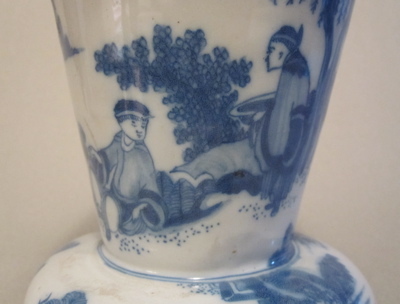 This unusual Japanese porcelain vessel has been a mystery to me ever since I purchased it in London in 2014. 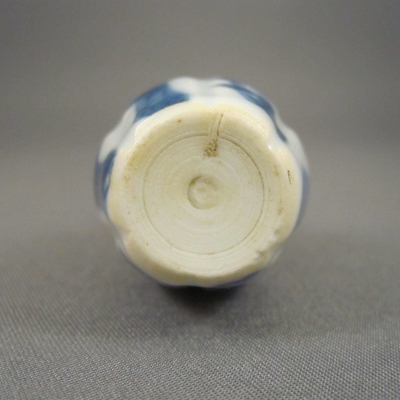 The dealer I bought it from knew little about it, so I have been researching it for the past few years. 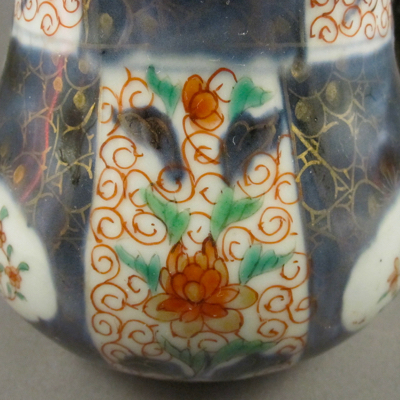 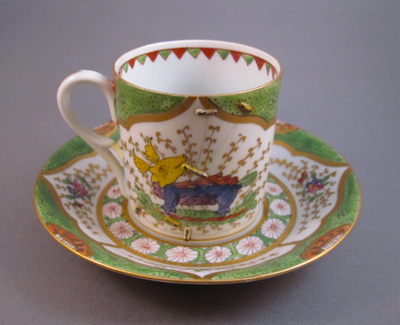 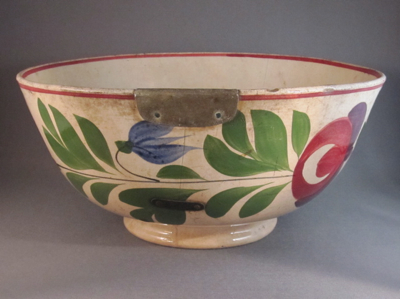 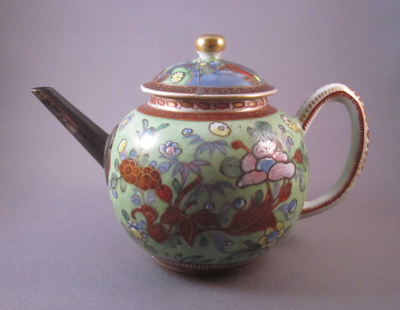 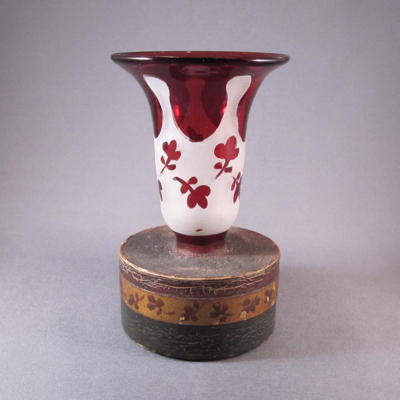 It stands 8.75 inches high and is decorated in the Imari style and color palette, including cobalt blue, iron red, green, and gilt accents. 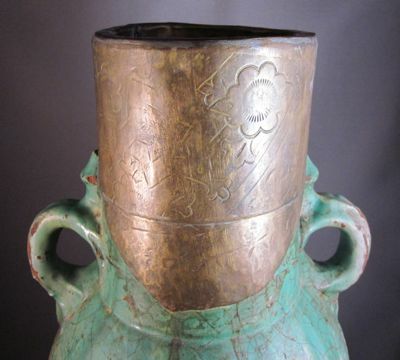 I asked some experts to weigh in on its function and age and their responses range from it being a shaving mug, an incense burner, to a tumba for drinking fermented millet. 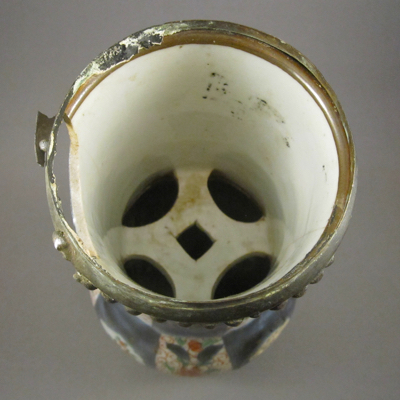 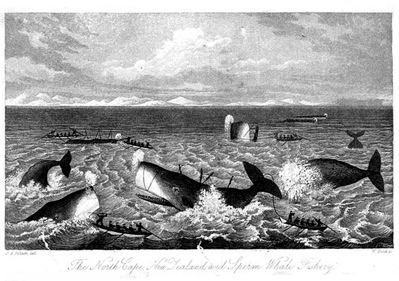 Most agree it was made during the Edo period (1603–1867). 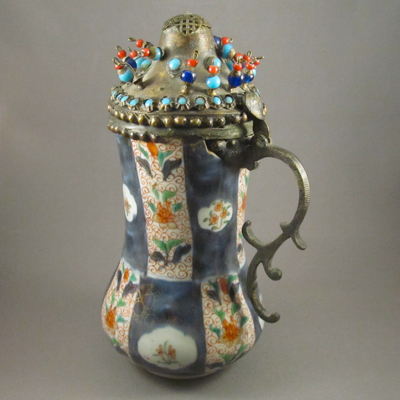 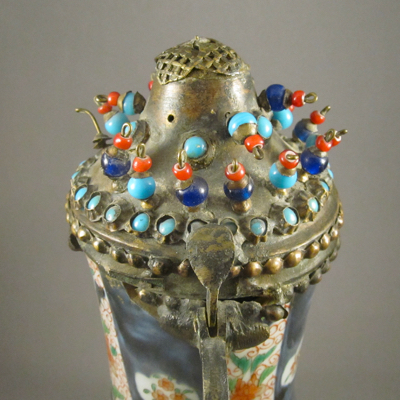 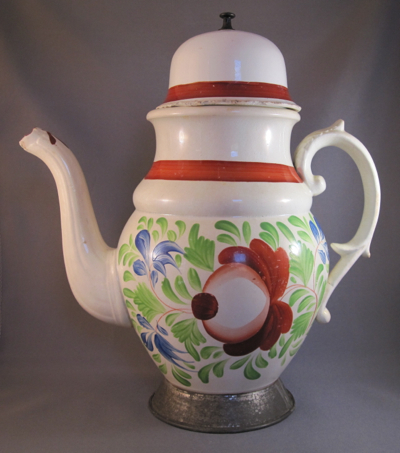 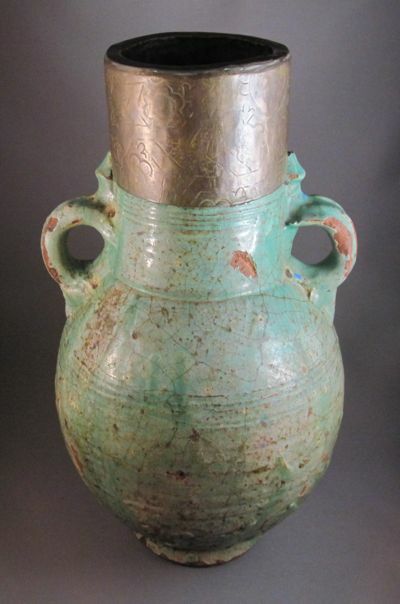 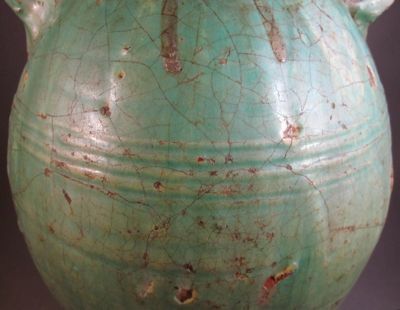 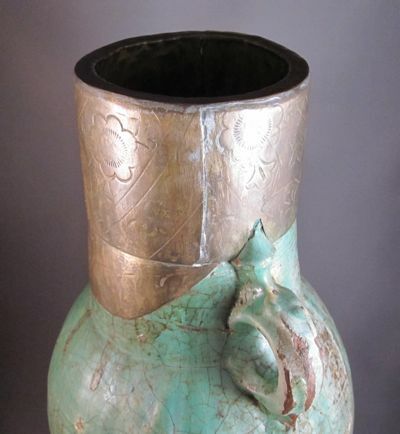 The original lid and handle broke over 125 years ago and were replaced in Tibet (others suggest Turkey and Persia) with an ornate replacement adorned with turquoise, coral and blue glass beads. 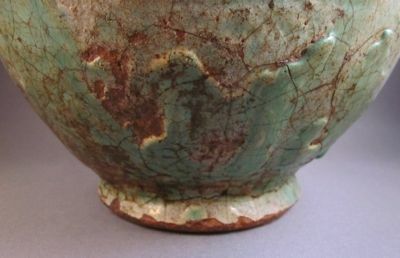 If anyone can shed more light on this mystery vessel, especially when it was made and its original use, I would greatly appreciate it. 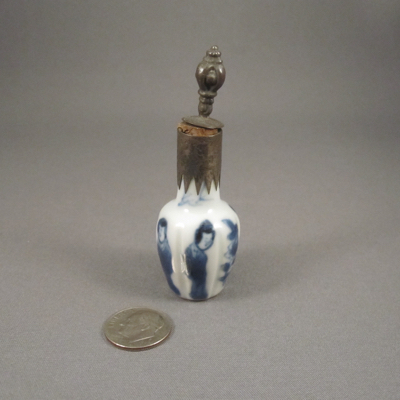 I seem to have a thing for miniatures. 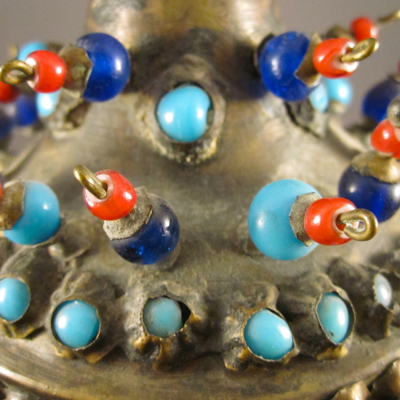 I marvel at the craftsmanship of creating tiny versions of larger pieces, which requires more time and skill, as well as good eyesight and nimble fingers. 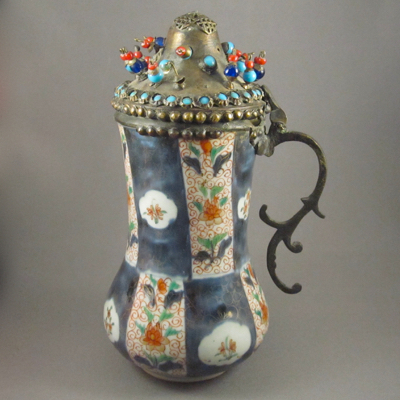 When I was at a street market in Egypt many years ago, I saw hundreds of lanterns made of tin and painted glass. 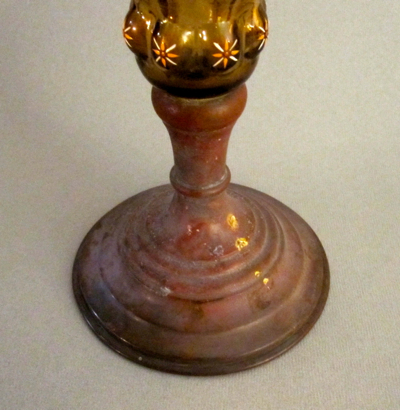 One vendor had minuscule working lanterns, no more than 3 inches, which held tiny birthday cake candles. 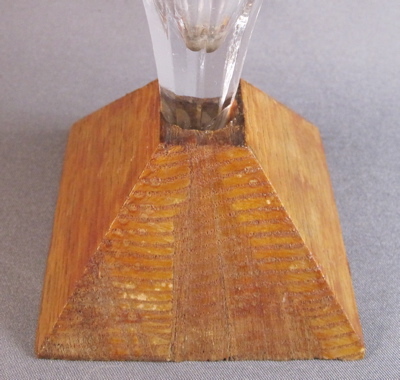 Even though they were a fraction of the size of the other lanterns, they were the same price and took just as long to make, if not longer. 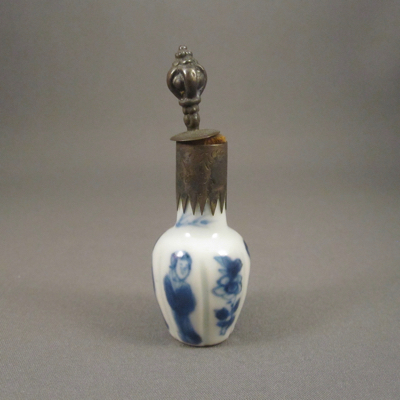 So you can imagine how I was doubly thrilled when I found this miniature porcelain dollhouse snuff bottle with an inventive repair. 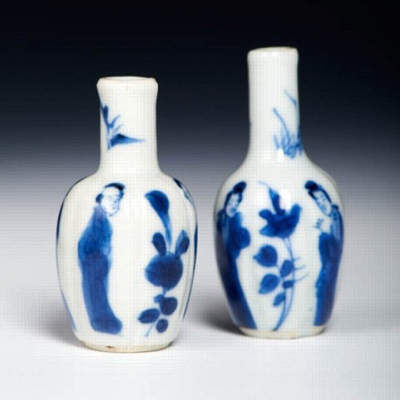 It was made in China during the Kangxi period (1662-1722), has blue underglaze decoration of figures, and measures 2.75 inches tall. 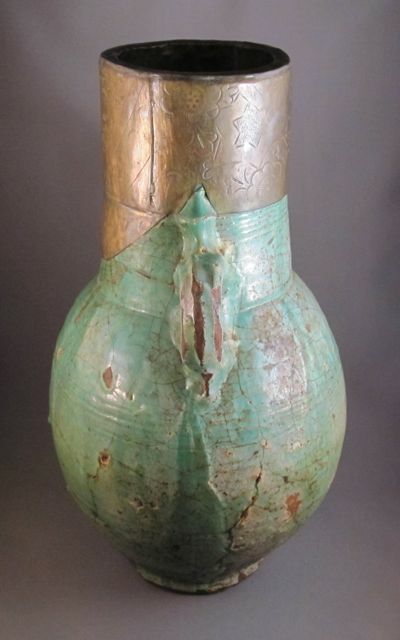 But there’s more to the story, as this bottle started its life as a vase. 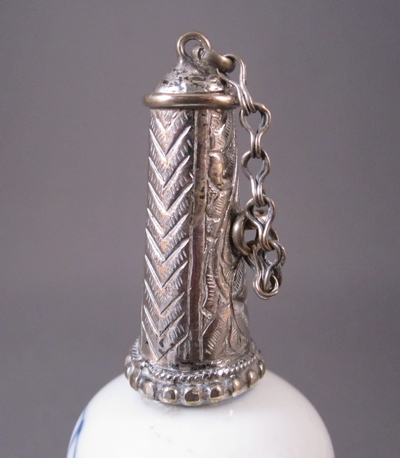 Well over 150 years ago, after its neck broke off, a silversmith added a silver collar with etched decoration, cork, and a top attached to a spoon, transforming the broken vase into a functional snuff bottle. 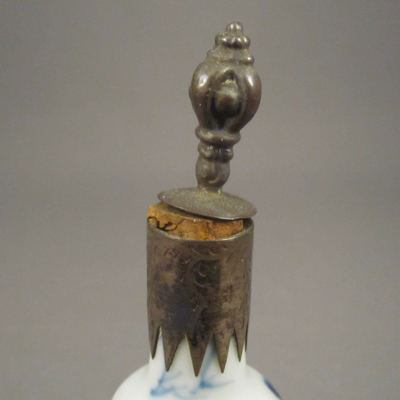 It has a sword shaped Dutch hallmark dating the repair to the mid-1800s. 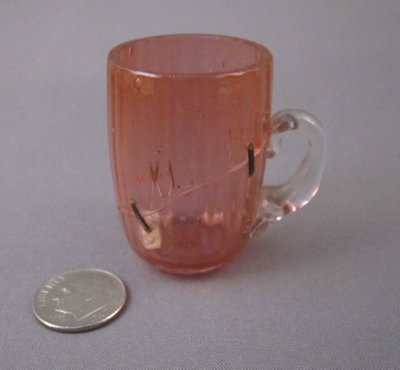 I now have five tiny Chinese dollhouse miniatures in my collection and try not to inhale too deeply around them. 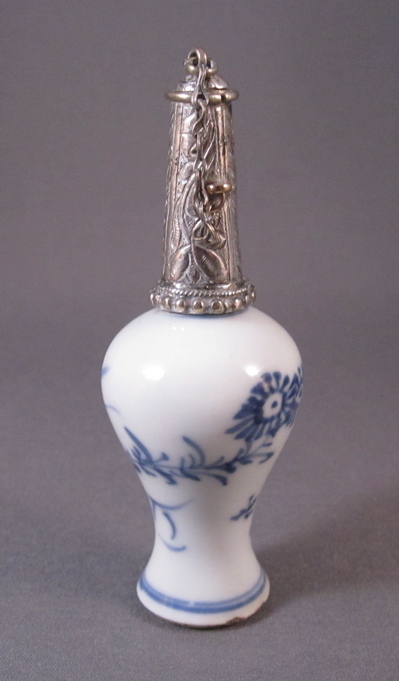 This pair of miniature vases with similar form and decoration show what the original neck on my vase looked like before it was transformed into a snuff bottle. 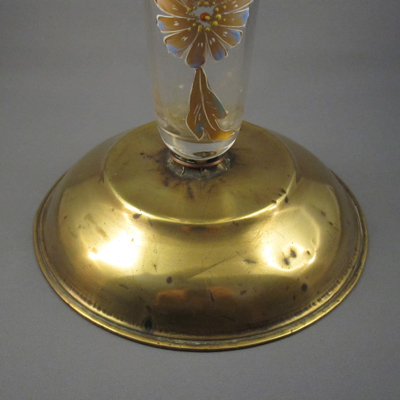 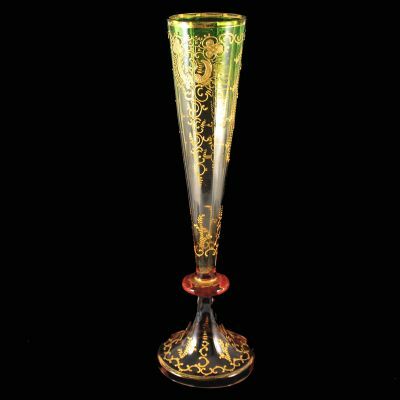 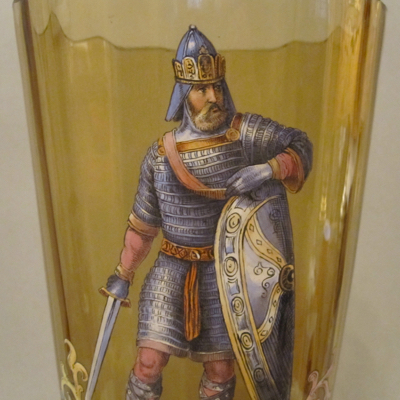 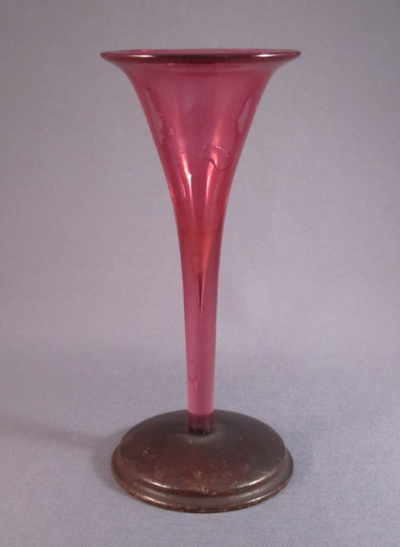 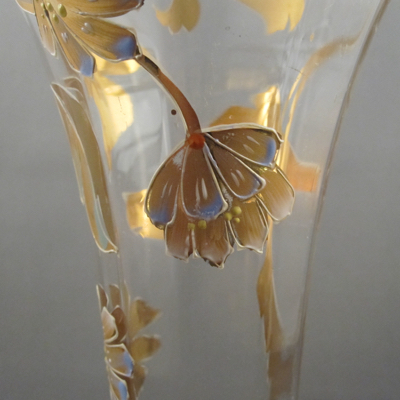 This tall, regal enameled amber glass pokal was made at the end of the 19th century by the esteemed glass manufacturer Moser, in Karlsbad, Austria; today known as Karlovy Vary in the Czech Republic. 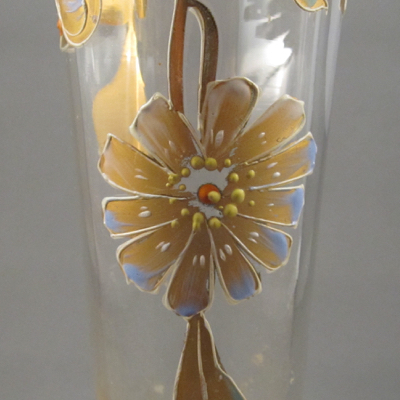 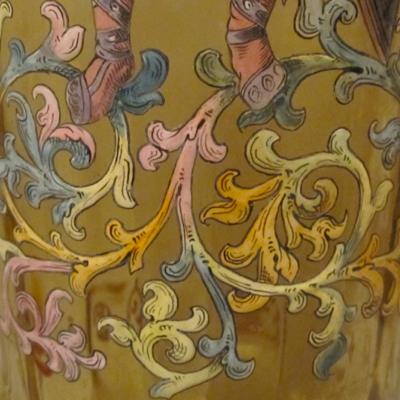 Ludwig Moser opened his first factory in 1857 and soon his artfully decorated glassware found its way into worldwide collections of presidents, popes, king, queens, and Liberace. 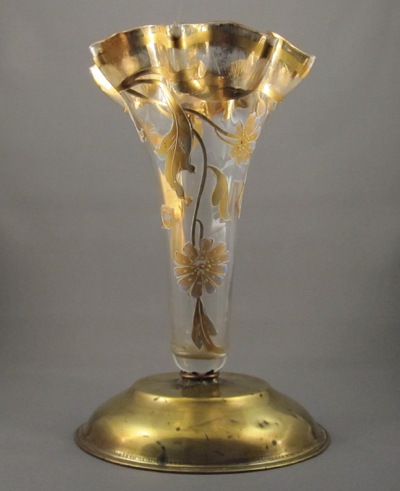 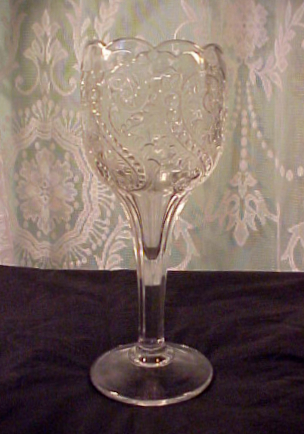 To the best of my knowledge, this pokal, which measures 15.75 inches tall, was not owned by Liberace. 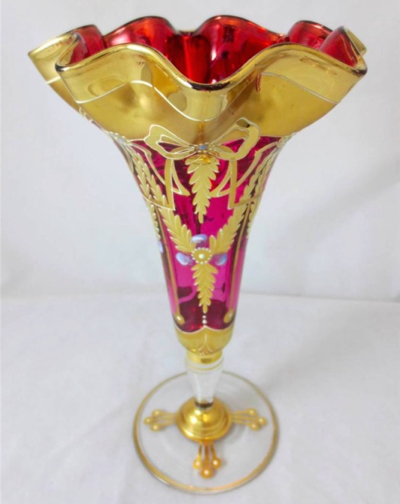 As the bulk of the pokal is quite heavy, I am not surprised that at some point it broke in two, snapping off at the base. 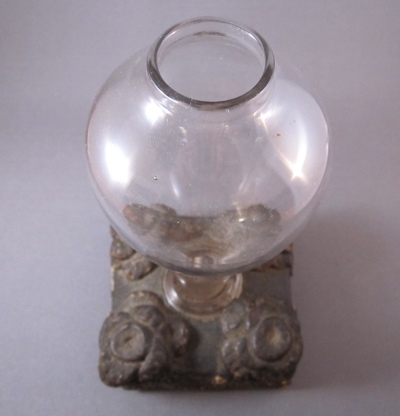 Luckily for me, an early practitioner of recycling secured the remaining unscathed upper portion of it to a sturdy brass lamp base, allowing it to be filled to the brim with beer or display an arrangement of fresh flowers. 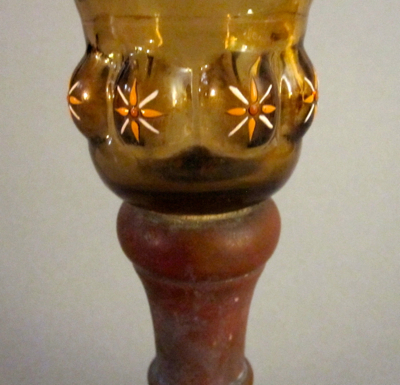 This tall amber glass vase made by Moser has its original base intact. 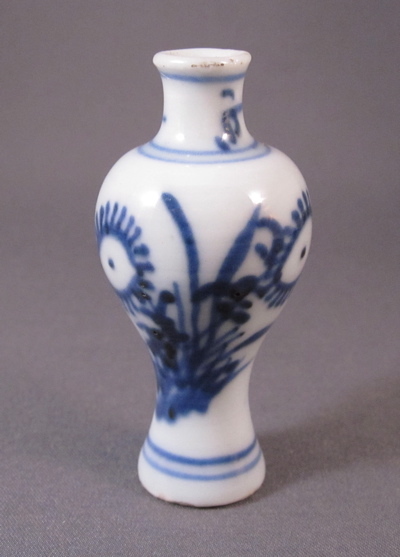 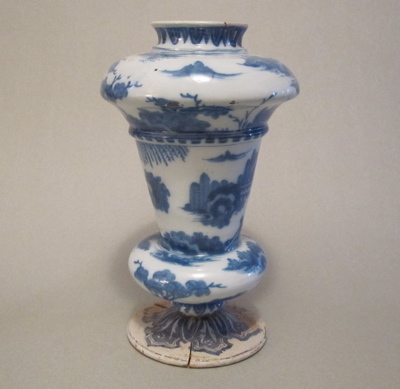 Chinese Kangxi period (1662-1722) miniature porcelain vase, decorated in blue underglaze floral design. 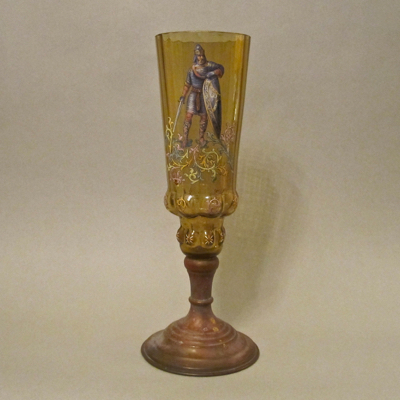 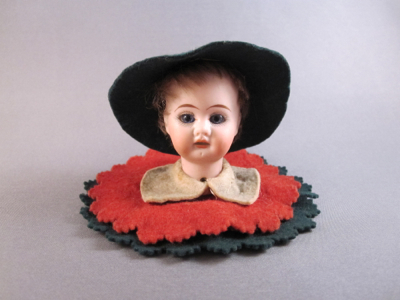 Costly miniatures such as this were collected by adults and were not necessarily made for children, although they are still commonly referred to as doll’s house miniatures. 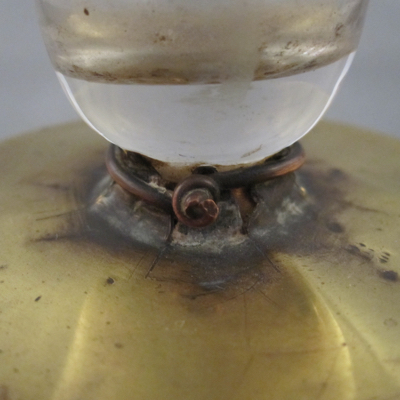 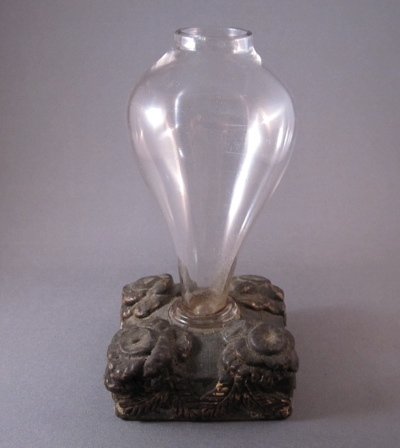 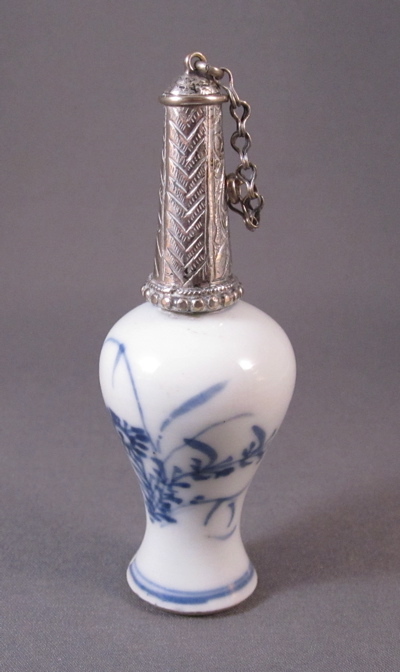 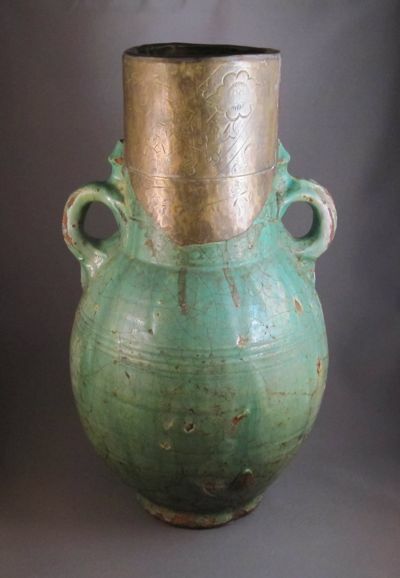 After the neck broke off, an unmarked chased silver neck with chain & stopper was added, most likely in Amsterdam, sometime in the early to mid 1800s, turning the vase into a scent bottle. 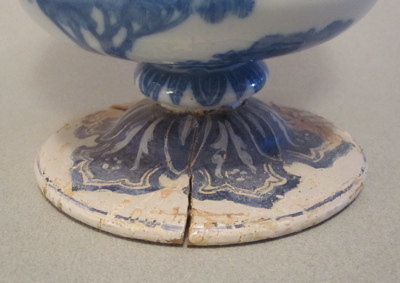 This is my favorite type of inventive repair; one where an object’s original function is altered and transformed into another. 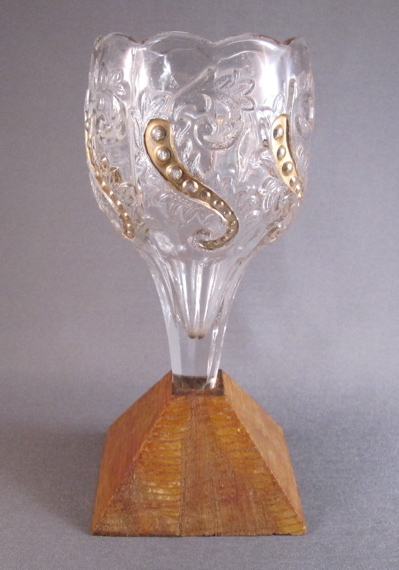 Scent bottle stands a mere 3-1/4″ tall. 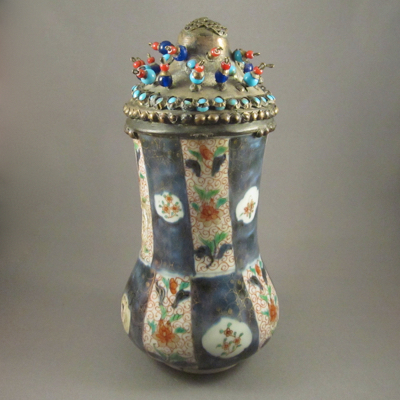 Please check out my other doll’s house miniature vases from the same period showing similar striking transformations. 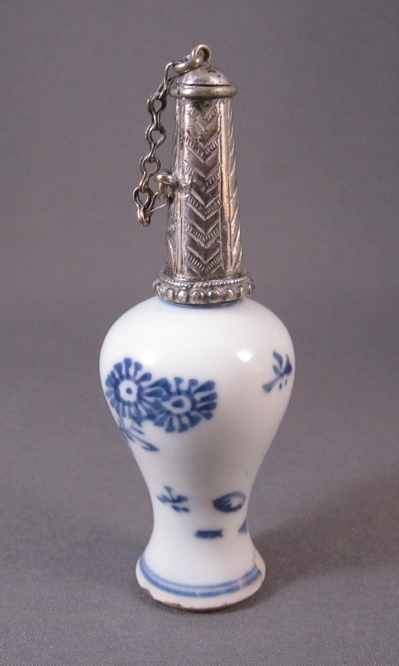 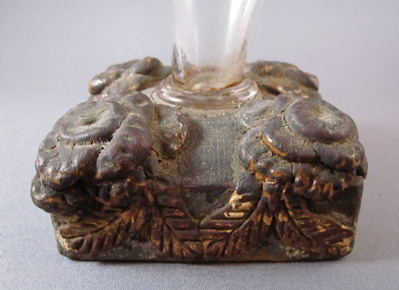 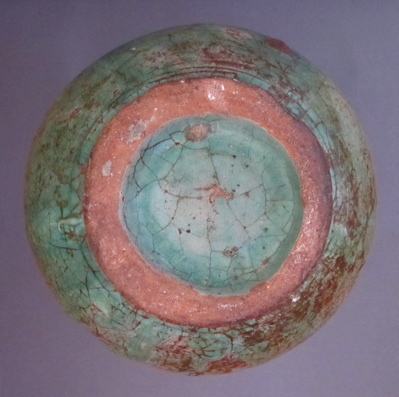 This miniature vase, with nearly identical form and decoration, shows the original form with an intact neck.